Except for paying extra for parking, the Hilton garden inn was an excellent hotel. The room had an excellent view with big windows. Parking was an additional three dollars. TOO loud at night time. Something was making a clonking, bonking sound. The Hilton Garden Inn Indianapolis is attached to the Chase Tower and adjacent to Circle Center Mall, Monument Circle, the Conseco Fieldhouse, and the RCA Dome and Convention Center. When guests are not exploring the many activities available in the downtown Indianapolis area, they are sure to be thrilled with the many comforts of their rooms as well as the wide range of amenities available at this hotel. A variety of restaurants are available in just a short walking distance, but this hotel also features a reasonably priced on site American style restaurant offering three meals a day and room service. Limited cooking facilities are also available in the rooms. With plenty of space and a variety of services as well as ample meeting facilities, this hotel is a comfortable and convenient home base for people planning a vacation or a business trip to the Indianapolis area. All rooms at the Hilton Garden Inn Indianapolis Downtown include cable television, microwaves, refrigerators, coffeemakers, full ironing boards and irons, hair dryers, two separate phone lines, high-speed wireless internet access, and a large work desk with desk level outlets and ergonomic chair. Guests to the Hilton Garden Inn Indianapolis Downtown will have a comfortable stay thanks to an array of complimentary services and amenities, which include guests' choice of valet or self parking, a 24 hour business center, and wireless internet in the lobby and restaurant. In addition to the restaurant, the Great American Grill is available for convenient breakfasts and a la carte lunches and dinners. A fitness center and indoor pool make staying in shape while on the road easy and convenient. On site laundry facilities and valet dry cleaning service offer choices for guests planning longer visits. 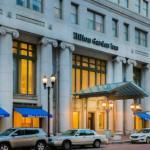 The Hilton Garden Inn Indianapolis Downtown is located in a historical building, combining the luxury of the old world with the superior amenities of the new, all at a budget-friendly price. The public areas are kept clean and well maintained, and the friendly staff is eager to offer assistance. The rooms are clean, quiet, and relaxing. This hotel is a great place to stay while visiting the many attractions of the Indianapolis area or merely stopping for a night while driving through.